Mailchimp's flexible pricing plans work with you as your needs change over time. Depending on your subscriber count and sending needs, you can choose to upgrade, downgrade, or pause your pricing plan. In this article, you'll learn how to change or pause your pricing plan. You can only downgrade to the Forever Free Plan once over the life of your account. If your account has been downgraded before, you won't be able to downgrade again. There is no limit on the length of time an account can stay paused, but you can only pause billing twice per 12 months. If you have fewer than 2,000 subscribers, and have never downgraded your account before, you can also choose to downgrade to the Forever Free Plan at the time you unpause. If your subscriber count increases while your account is paused, you'll need to purchase the appropriate Monthly Plan or Pay As You Go credit block to send emails when you unpause the account. 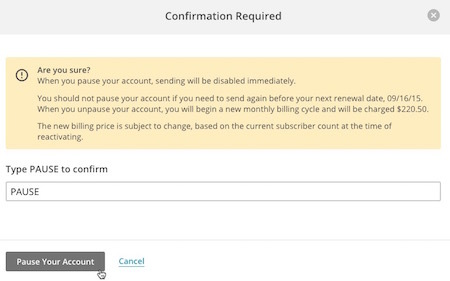 If you use Mailchimp Pro or our Social Profiles add-on, you'll still be charged for them when billing is paused. 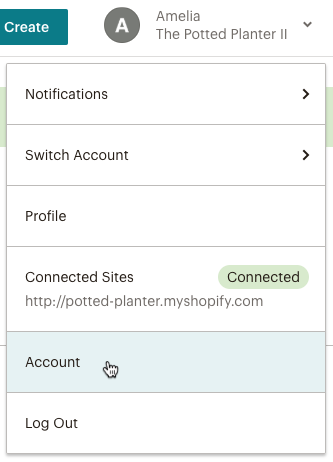 To prevent these charges, deactivate Mailchimp Pro and disconnect Social Profiles when you pause billing. If you're on a Monthly Plan and purchase Pay As You Go credits, we'll move you to a Pay As You Go Plan and stop monthly billing. On the Pay As You Go Plan, credits are like postage stamps. You need one credit for each email you send. Make sure you have enough credits in your account before you send an email campaign. To purchase credits and switch your pricing plan from Monthly to Pay As You Go, follow these steps. 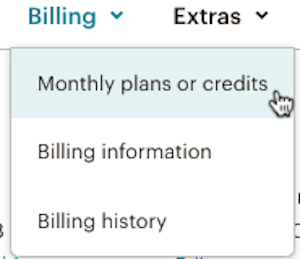 Click Billing in the Account navigation bar, and choose Monthly plans or credits. 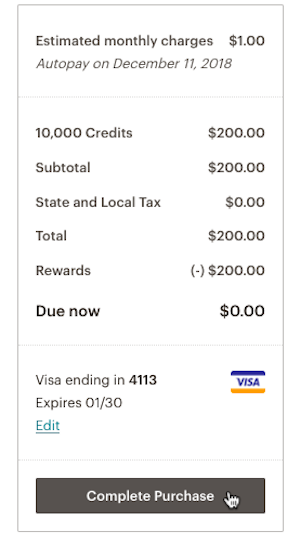 Click Pay As You Go to see the credit block options. 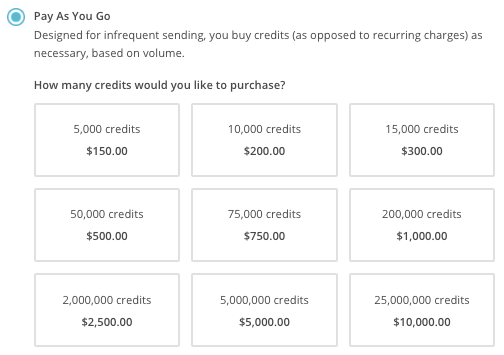 Click the credit block you want to purchase. In the sidebar, input your new payment method in the fields provided. If you previously saved a payment method, enter your credit card's security code in the CVV field. If you switch from a Pay As You Go Plan to a Monthly Plan, our system will look at the last billing cycle to determine your subscriber count and billing tier. Any remaining Pay As You Go credits will be converted to MonkeyRewards and applied to your subsequent bills. To switch from a Pay As You Go Plan to a Monthly Plan, follow these steps. Click Monthly. We'll show your monthly fee based on the current number of subscribers in your account. Click the Estimate future cost link to open a billing calculator, which explains other available Monthly Plan pricing tiers. If you're on a paid plan with fewer than 2,000 subscribers, and want to stop payments, you can downgrade to the Forever Free Plan once over the life of your account. To downgrade to the Forever Free Plan, follow these steps. If you've downgraded before, or have more than 2,000 subscribers, you won't be able to click this option. In the Are you sure? pop-up modal, type DOWNGRADE. Click Downgrade. Any remaining Pay As You Go credits will be lost when you switch to the Forever Free Plan. In addition, if you exceed 2,000 subscribers after you downgrade, we'll put a hold on your account until you switch to a paid plan. If you're on a Monthly Plan and don't need to send campaigns for a while, you can pause your monthly billing. When you pause your account, we immediately end the current billing cycle and suspend sending privileges. You can leave your account paused for as long as you need, and when you're ready to send campaigns again, just purchase an appropriate pricing plan to reactivate your account. You can still use Mailchimp to create and edit campaigns and templates, and to view reports and make changes to your audience, but you won't be able to send campaigns, test emails, or automated emails until you reactivate the account. We'll continue to manage new contacts who subscribe to your emails, and send signup confirmation and welcome emails. 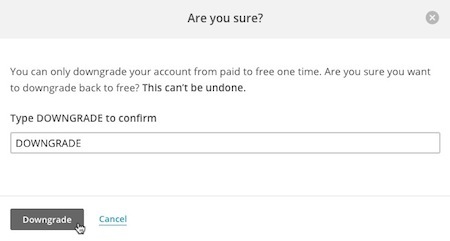 To pause billing on your account, follow these steps. Click Settings in the Account navigation bar, and choose Pause or delete account. Click Temporarily pause billing on this account. In the Confirmation Required pop-up modal, type PAUSE. You'll see a success message when your account has been paused. To unpause billing, you'll need to choose a Monthly Plan to meet your current subscriber count or purchase Pay As You Go credits. After you unpause billing, be sure to reactivate any recurring emails in your account, like automations and RSS campaigns. To unpause billing on your account and resume sending campaigns, follow these steps. On your Dashboard, click Restart Account in the alert banner. On the Edit your billing plan page, choose the plan that works best for you, and update your billing information if needed. 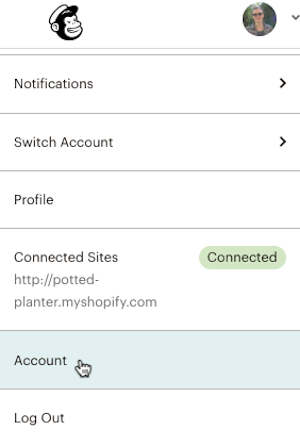 If you no longer need to use Mailchimp, you can pause your monthly plan or permanently close your account. Mailchimp's paid plans let you store more subscribers and give you access to premium features. Learn how to upgrade your account to a paid plan.